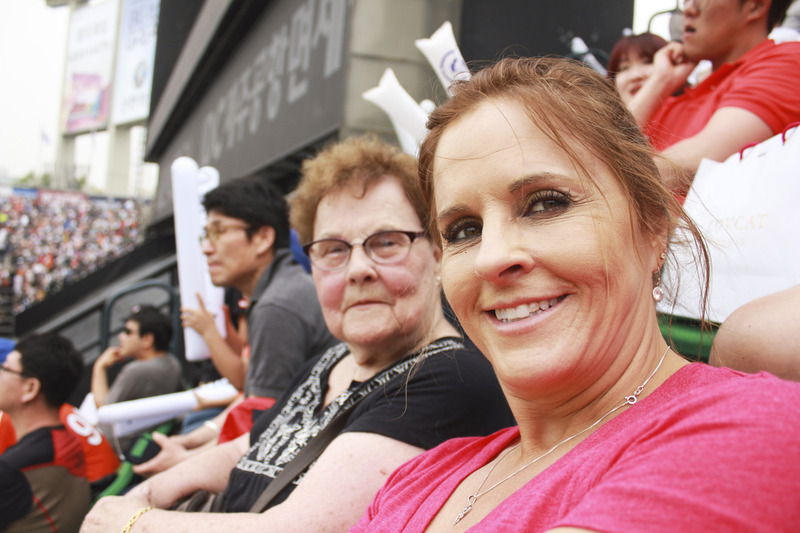 We’ve managed to check an item off our Leaving List – Korean baseball. I’ve been to a lot of baseball games in the US and enjoy sitting outside and basking in the sunshine and scarfing down some good food and beer. I’m not a baseball fan. It’s still usually fun and relaxing if the weather is right. Korean baseball is a whole other ball game 😉 . 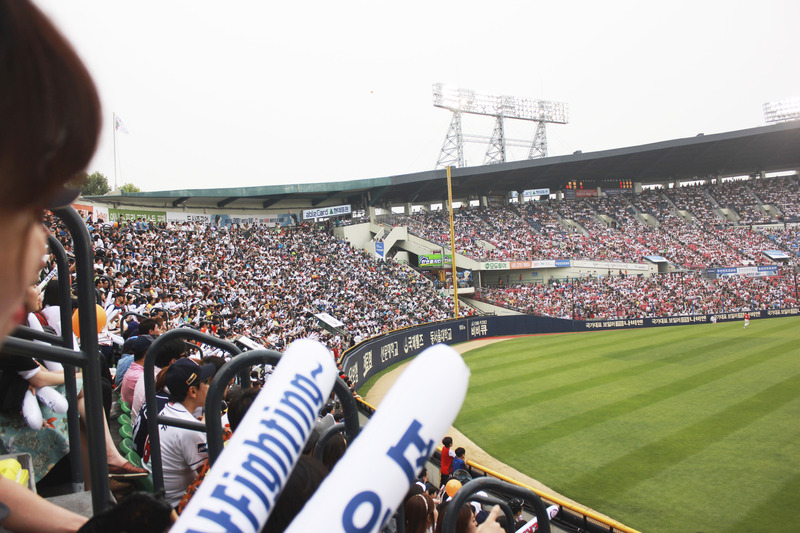 Korean baseball fans are fans. They cheer. There are cheerleaders. One of my friends told me that in university in Korea all the fans would get together with the cheerleaders before games and practice cheers, and I feel the same must be true for baseball fans. It’s like the whole stadium knows the cheers and exert all their energy to cheer their team on, regardless of what is really happening in the game. Cheering is serious stuff. Therefore it creates a ridiculously fun atmosphere. We went to Mokdong Stadium to see the Heroes, our closest team. Some friends seem to like the Jamsil stadium a lot more but we found Mokdong really orderly, full of good food and great fans. 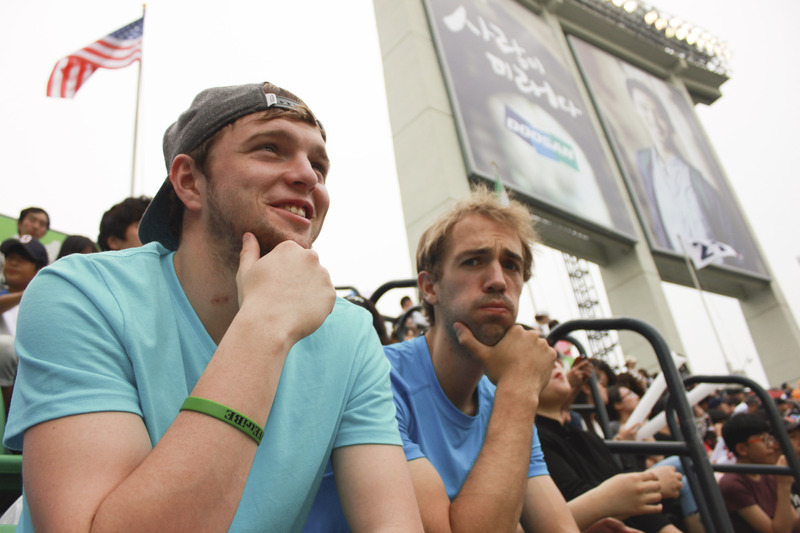 We went to the Jamsil stadium last year but had just as much fun in Mokdong. We arrived and bought tickets at the counter right as the game was beginning (just like last time), and ended up standing in the general seating area for a good long while. I think if we had gotten there earlier we would have gotten seats, but it might be a good idea to check out the online shop and see if you can figure out how to purchase tickets. Still, even standing we got a great view, enjoyed people watching, cheering, and generally making mayhem with the wild Korean fans. One of the best parts about Korean baseball? Reasonably priced food and beer. It costs the same as buying beer outside of the stadium, making it an affordable choice to spend the afternoon indulging in (bad) beer, fantastic people-watching, and basking in the sunshine. I’ve only been to two games living in Korea, but both have been awesome experiences that offer a rambunctious look into Korean life. It’s something I don’t normally do while traveling but have had a blast both times. If you’re ever in Korea, come check it out.